I am very excited to introduce you to Kristen of We Be Reading today as she shares an AMAZING experience with you. I will leave the details to her, so let's get to it! Don't forget to check out the fun surprise at the very end! 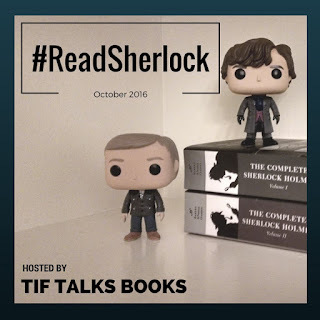 I was so very lucky that the opening of the International Exhibition of Sherlock Holmes at Seattle’s Pacific Science Center happened during Read Sherlock month! I got to attend the center’s member preview day last Friday and now get to take all of you on a quick tour through this amazing interactive exhibit. When you first enter and pass the employee in the deerstalker cap who gives you your detecting notebook, there is a room with background information -- mention of the first detective stories (Poe’s tales of C. Auguste Dupin), the coverage in the London press of major crimes (namely Jack the Ripper), and the state of detection and forensics at the time that Arthur Conan Doyle first imagined up Sherlock Holmes. There are pictures and paragraphs about Joseph Bell and other pioneering doctors and lots of forensic items like crushed skulls and preserved human skin with stab wounds. This exhibit is definitely not for the faint of heart! I was also thrilled to find, right there in the front, a couple of pages of the original draft of The Hound of the Baskervilles! Doyle had beautiful handwriting and it was amazing to see these pages. Next there is a large area that looks like a Victorian street and it is where all of the attending detectives are able to learn about many of the different things that an investigator at the time would have needed to know about--microscopy, botany, poisons, ballistics--and also about the forms of communication and the police force at the time. There is even a pair of working telegraph stations where you can tap out a message to a friend at the other end and receive one back. The entire point of this room is to get detectives ready to use their notebooks and powers of deduction to investigate a real crime scene. As we all know, the best way to get word of an insolvable crime is to sit in the study of Sherlock Holmes at 221B Baker Street and wait for Inspector Lestrade to arrive! The room is fully stocked with poisons, weapons, books, and a tea tray, presumably prepared by Mrs. Hudson. Once you find out about the alleged murders from the nearby phonograph, you get to walk through various stations and use your newly-developed detecting skills to confirm or (more likely) debunk the findings of Lestrade and hopefully solve the crime. There are places to investigate all of the different types of physical evidence found at the scene. The kid and I were most impressed by the station that allowed you to produce different types of blood spatter. It was a difficult mystery and we weren’t entirely successful in solving it but it was incredibly fun! Finally, there is a room with tons of Sherlockiana and props from the various recent movies and television shows. Because Elementary is my favorite, I made sure to get this picture of Sherlock’s clothes and his lock wall. I didn’t forget those of you who love BBC’s Sherlock though and so you get a bomb vest and a pink suitcase. Overall, this was an incredibly fun exhibit and I would even consider going back, both to do better on my detecting and to spend more time reading and seeing all of the amazing background details throughout the exhibition. It will be here until January 28 of next year so if you happen to have a trip to Seattle planned, be sure to schedule a visit to the Pacific Science Center! As you can imagine, there was an amazing gift shop at the end of the exhibit full of books and costumes and jewelry and more. 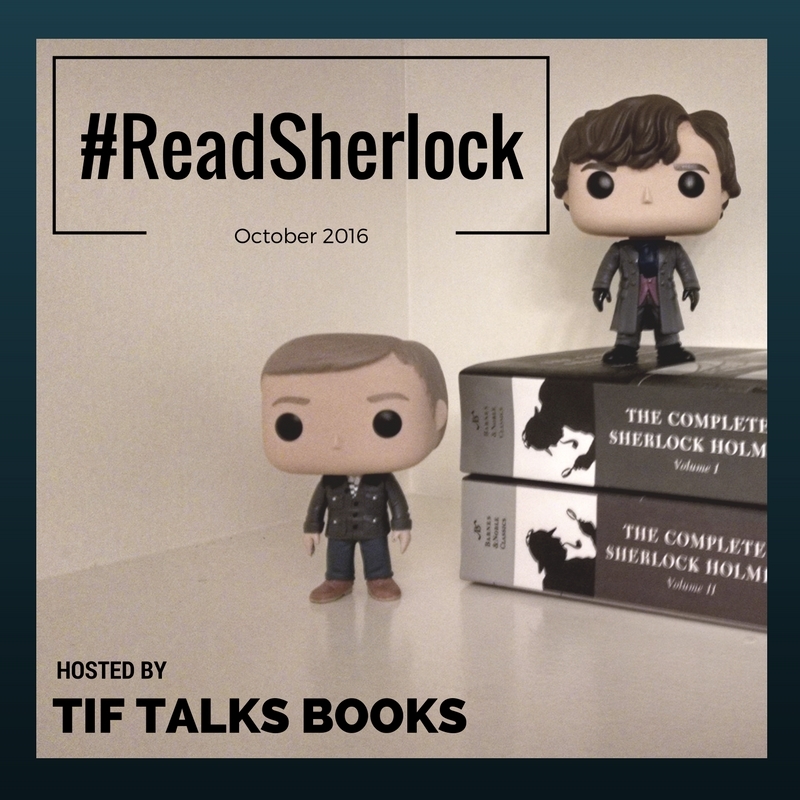 I couldn’t resist picking up a couple of little things to share with one lucky post reader -- an I AM SHERLOCKED felt bookmark and an adorable little pin that says “The world’s only consulting detective”. To be entered to win (international and Tif entries are ok!) just leave a comment below about your favorite Sherlock actor and I’ll pick a winner at the end of the month. I hope it was fun going through this exhibition with me. Thank you to Tif for the opportunity to share this with all of you! I seriously wish I was in Seattle right now so I can attend this! It looks so amazing!! Thanks so much for joining us Kristen, and offering such a great giveaway!! Oh, I totally forgot to share my favorite Sherlock, but I figured everyone had this figured out by now ... Benedict!! What an amazing event!! Its hard to pick a favorite but i will say Peter Cushing because I love the vintage sherlock as much as Benedict . Thanks for the giveaway! I totally need to see this exhibit. Didn't know such things existed. This exhibit sounds awesome! I have not gotten around to watch Sherlock yet. My favourite Sherlock inspired character is Basil from the Great Mouse Detective. How cool! I would LOVE to do something like this. I visited 221 Baker Street in London last year (just saw the outside and peeked in the window because it was closed), and we JUST missed a Sherlock exhibit at the British Museum, which was a bummer. I love all things Sherlock! I love Robert Downey Jr and Benedict Cumberbatch's portrayals of Sherlock, but I guess if I had to choose it would be Benedict.